The Giant Fortune Cookie company is all about helping you say what you feel in a fun, memorable and BIG way that the special people in your life will always remember. We’re here for one purpose: to make your gift giving unique, easy, fast, fun and simple. Sending a giant fortune cookie is like sending an edible wish that expresses your thoughts and feelings in a way your recipient will never forget. 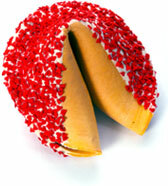 They’ll receive the largest, freshest and tastiest fortune cookie they’ve ever seen in their life. Whether it’s a special birthday wish, a from-the-heart anniversary gift, a giant I Love You message, or a corporate Thank You fortune cookie, we guarantee they’ll love it. 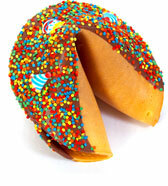 Every giant fortune cookie is baked fresh, handmade, carefully dipped in the finest Belgian chocolate and expertly decorated just for your special occasion. 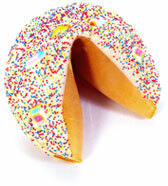 Each giant fortune cookie comes individually wrapped and beautifully packaged with colorful sizzle in a distinctive white gift box, tied with a coordinating bow. Best of all, your cookie comes with your personalized, foot-long message inside. 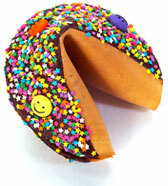 Giant Fortune Cookies is a sister company of Fancy Fortune Cookies, which has been in the business of making and reliably delivering worldwide millions of personalized gourmet fortune cookies since 1988. 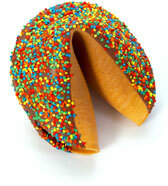 We are the inventors of flavored and colored fortune cookies, and our innovation continues today.